Basket packed with colorful seasonal blooms Flowers are seasonal in this arrangement. 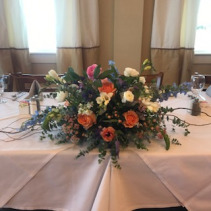 What is pictured is not necessarily what you will receive, as this is an artistic designer’s choice arrangement based on florals that are currently in season. All of our arrangements are one of a kind. 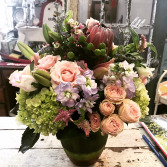 We will never truly duplicate an arrangement. Photos on this website are used for guidance only. Containers are also unique and will vary. Beautiful mix of spring flowers. *Available in Spring only Flowers, colors, and container will vary based on availability. If you have any requests, please write them in the message box upon checkout. THIS PHOTO IS A GUIDE. We approach our designs with artistry, not replication. All designs are unique. Fresh, soft, Queen Anne's lace and other spring flowers loosely arranged Pedestal not included *Flowers are seasonal in this arrangement. What is pictured is not necessarily what you will receive, as this is an artistic designer’s choice arrangement based on florals that are currently in season. 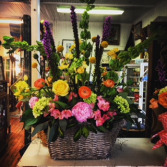 All of our arrangements are one of a kind. We will never truly duplicate an arrangement. Photos on this website are used for guidance only. A chorus of mixed, fragrant flowers *Flowers in this arrangement are seasonal. 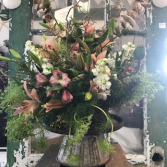 This arrangement features a low container and an assortment of seasonal flowers based on availability that the photo may not reflect. Flowers are always on the brain! 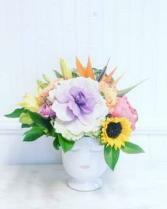 Send some love in our awesome selfie vases! Pictured: Large $150 and Medium starting at $65-$85 *Flowers in photo are seasonal. This is a designer’s choice arrangement using premium seasonal florals. Flowers on the brain forever and always! This is a beautiful showcase of unique florals. *Flowers are seasonal in this arrangement. 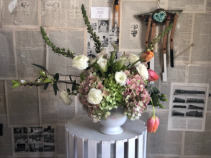 What is pictured is not necessarily what you will receive, as this is an artistic designer’s choice arrangement based on florals that are currently in season. All of our arrangements are one of a kind. We will never truly duplicate an arrangement. Photos on this website are used for guidance only. Current mood: this arrangement is a designer’s choice arrangement. Unique, beautiful, and filled with premium seasonal florals. *Flowers are seasonal in this arrangement. 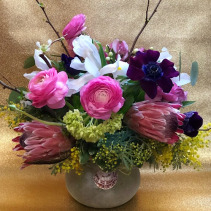 What is pictured is not necessarily what you will receive, as this is an artistic designer’s choice arrangement based on florals that are currently in season.